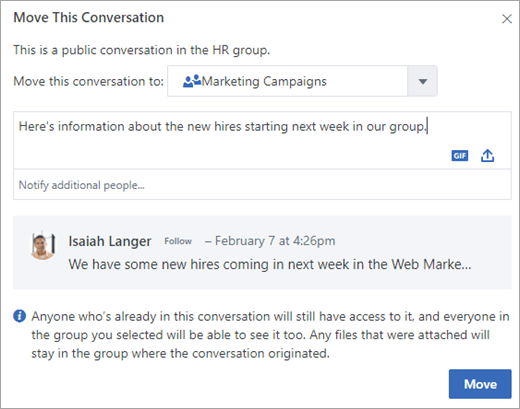 Sometimes the Yammer group you first post a message to isn’t the right one. Any user can move a conversation, poll, or praise to a different group in order to make sure the right people see it. Find the first message in the conversation you want to move. In the first message, click the More menu , and then click Move Conversation. Select the destination group and add a reply to the conversation if you would like. Click Move. The conversation is moved to the new group. A banner appears once the﻿ conversation has been successfully moved. Q: Who can move a conversation? A: Any user with access to a conversation can move it. Q: Who can see the conversation after it's moved? A: All conversation participants before the move and all users with access to the new group can see the conversation after it's moved. Q: Are files in the conversation moved to the new group? Q: After a conversation has been moved to another group, who can access files attached to it? A: Everyone has access to files in conversations that are moved between public groups. If a conversation was moved from a private group, only members of the group that the conversation was originally posted to will have access to its files. If the conversation is moved back, anyone currently participating in the conversation (regardless of group membership) and all the original private group's members will have access. Q: Will the post I move remain in the old group? A: No, the post is only in the group it's moved to. It's not copied into both groups. Q: Can you move a conversation to more than one group at a time? A: No, you can only move from one group to another group. Q: Can you move a conversation again after it's been moved? A: Yes, conversations can be moved multiple times. Q: What if I make a mistake and send it to the wrong group? Q: Which conversations can be moved? A: All conversations in public and private groups can be moved. Q: Where can conversations be moved to? A: Users can move conversations to any group they have access to (public or private). Q: Can you move conversations in external groups? Q: Will users be notified if a conversation is moved? 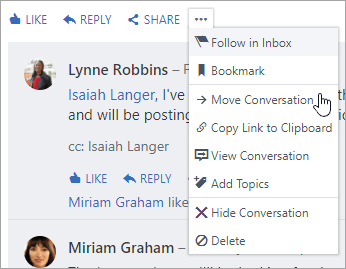 A: Yes, all users involved in the conversation get an inbox notification. A system message is added to the conversation when it is moved. The message includes who moved the thread, where it was moved from, and where it was moved to. Q: Can you move announcements?